‘Mackerel, love – you won’t get fresher!’ winked the fishmonger at Southwell’s Saturday market. Ten flavours of sausages to the left of him, a hundred colours of cotton reel to the right, and countless jokes in his arsenal. 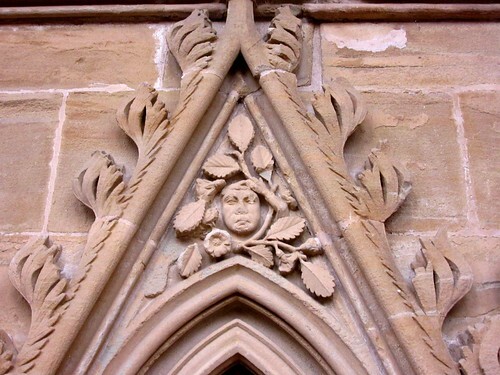 I saw that very face later in the morning, agelessly cheerful and knowing, where some unremembered mason had carved it seven hundred years ago on a bracing rib of the Chapter House in Southwell Minster. 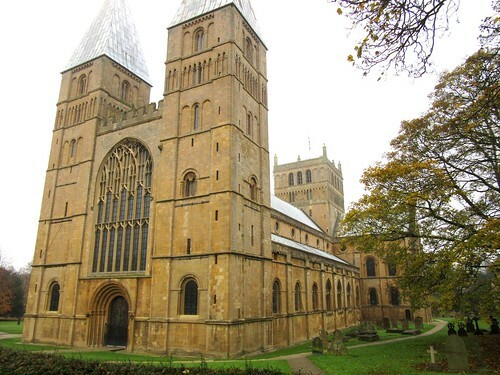 Southwell is a snug, self-sufficient little Nottinghamshire town, full of gorgeous red-brick houses, with the spectacularly large and beautiful minster church as its pride and joy. 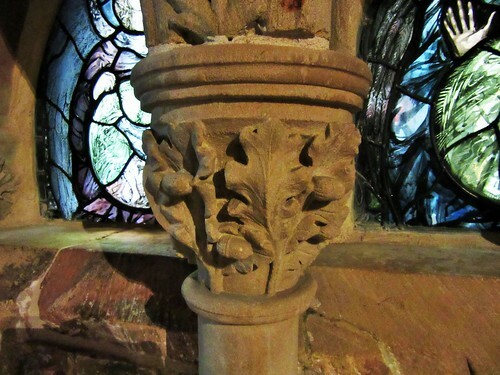 There’s a warm honey glow to the stone, and a treasure of carvings still sharp in detail. Contorted faces peeped and grinned from the 14th century choir screen – a peasant riding a laughing king, a churl giving his bum a good scratch. 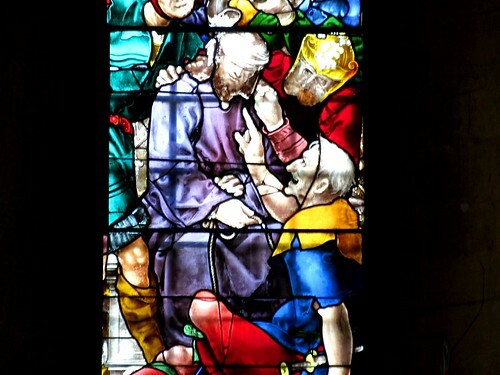 In the Chapter House were leaves of oak and field maple, exquisitely fashioned, and a riot of tiny, boldly staring Green Men, some defaced by the sword cuts of Puritan zealots. Anyone who could greet such figures with outrage rather than laughter and wonder must surely be in need of a humour transfusion. I came out of the Minster with a head full of marvels to find a chilly mist settling down across the Nottingham countryside. 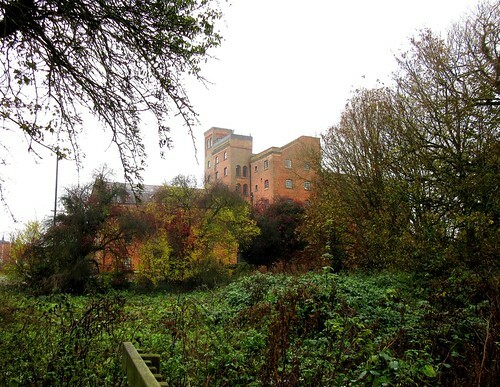 The Robin Hood Way trail led me out of Southwell along the track of an old railway that once brought coal and silk to the town – coal from the Nottinghamshire pits to burn, and silk to be spun in the big brick mill out at Maythorne beside the winding River Greet. From Maythorne and its handsome old workers’ cottages I crossed into Norwood Park, once the private deer park of the Archbishop of York, now the haunt of golfers. On among stumpy apple trees, their boughs entwined with mistletoe, and south through the big open pastures and biofuel acres of the Brackenhurst Estate. Then a homeward plod across the misty plough, slipping and sliding among beet plants, with the shouts of Southwell’s Saturday footballers coming up from the pitches by the Potwell Dyke. I didn’t catch a glimpse of the twin towers of the Minster until they loomed magnificently out of the mist, right above my head. 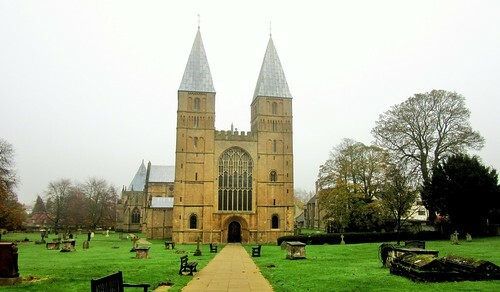 Walk (6½ miles, easy, OS Explorer 271): From Minster, right down Church Street. At S-bend, bear left (703538); take right-hand of 2 paths (‘Potwell Dyke, Robin Hood Way/RHW’). In 300m, cross road (706539) and on. In 250m, cross Newark Road and on (708540, RHW). In 50m, dogleg right/left down Merrison Way. Follow RHW to A612 (710541). Left and left again along railway trail (RHW, Southwell Heritage Trail/SHT). 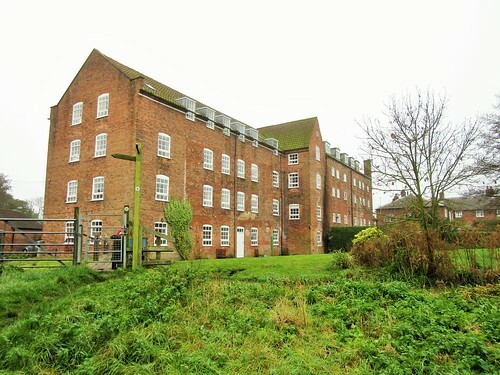 In 500m, at road, dogleg right/left past Caudwell’s Mill (707544), and on, following RHW on right bank of River Greet for 1¼ miles to Maythorne Mill (697557). 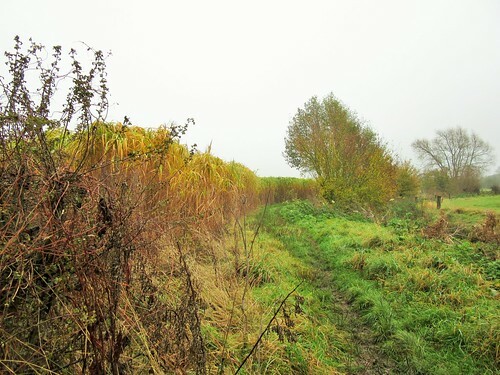 Cross river (RHW, SHT); down road, across old railway (695554), on to Kirklington Road at Maythorne Cottages (692551). Dogleg right/left into Norwood Park. Along drive past golf course (yellow-topped posts). In 600m, at crossing of tracks (689546, fingerpost), bear half left through orchard, then between greenhouses, for 600m to cross Halam Road (690540). On across field; cross B6386 (690538) and on; cross next road (690537, fingerpost) and on to cross footbridge. Here path forks; take left fork along hedge. 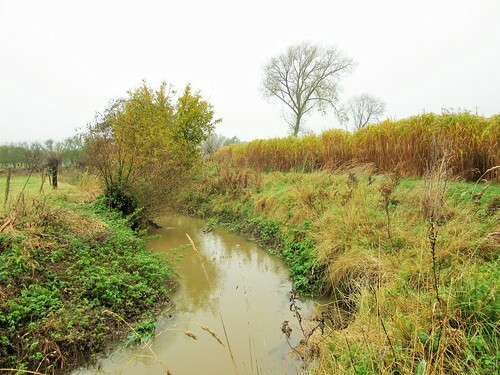 Cross Westhorpe Dumble stream (690534); on far bank keep ahead up slope, then along field edges. At a hedge (691529, RHW) dogleg right/left; on to road (691524). Left (RHW) to cross A612 (695525 – take care!). 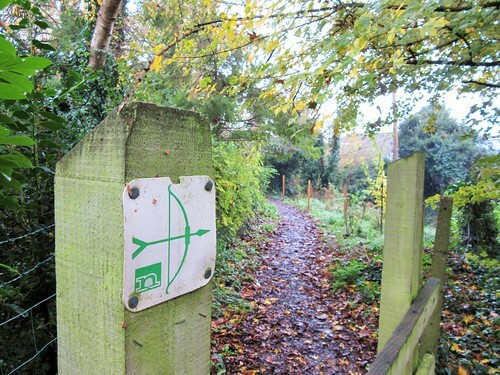 Right for 150m; left (694523) along Hicking Lane between University buildings. Through wooden gates and on to second pair of gates (699524). Left; in 200m, opposite road on left, turn right through gate (698526, RHW), and on to road (700526). Right; in 70m, left (fingerpost, RHW) across field to waymark post (702529, RHW). Half right to hedge gap (704530). Left here with hedge on right, downhill past football field to path (702534). 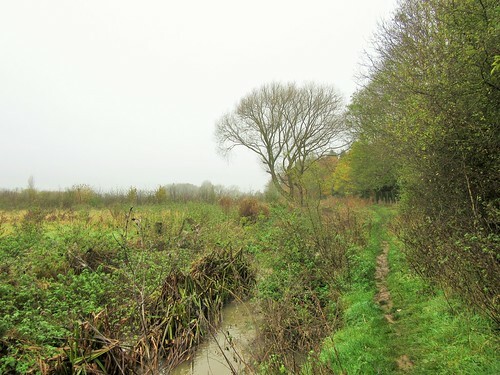 Right (yellow arrow) and left across Potwell Dyke; follow lane to Minster. Accommodation: Saracen’s Head Hotel, Southwell, NG25 0HE (01636-812701) – characterful, creaky and comfortable. 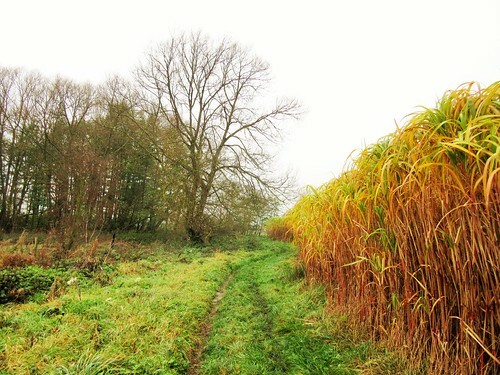 Local Trails: downloadable at southwellcouncil.com.